Located on a spacious corner lot on cul-de-sac of gated community, this beautiful 3/2 home has an open floorplan that is great for entertaining, spacious bedrooms and bathroom for guests, and two large walk-in closets (his and hers) in the master bathroom with built-in drawers and shelves for storage. 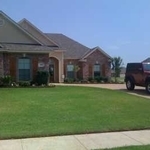 The home is located in the Village of Tiburon, one of the premier neighborhoods in North Bossier, and is located in the Airline High School school district. The elementary school for this district, W.T. Lewis, is approximately one mile from the neighborhood and is Bossier's newest elementary school. The neighborhood is also only minutes away from Bossier City's dining/shopping and Barksdale Air Force Base.